I couldn't resist that title. But seriously, it did! Okay, so Cali was just another South American city (Colombia's second largest) and a few more churches, and another plaza. Yep, what else? Um, a river and some crazies. From the south, its downtown area stretched endlessly: block after block of littered streets and imposing, frankly terrifying, armored police vehicles, blasting horns and stray dogs, grimy restaurants and equally grubby street sellers. Narrow, pothole ridden, alleyways made narrower by hastily-built wooden stalls screaming at you from what was left of the sidewalk. Like I said, just another South American city. 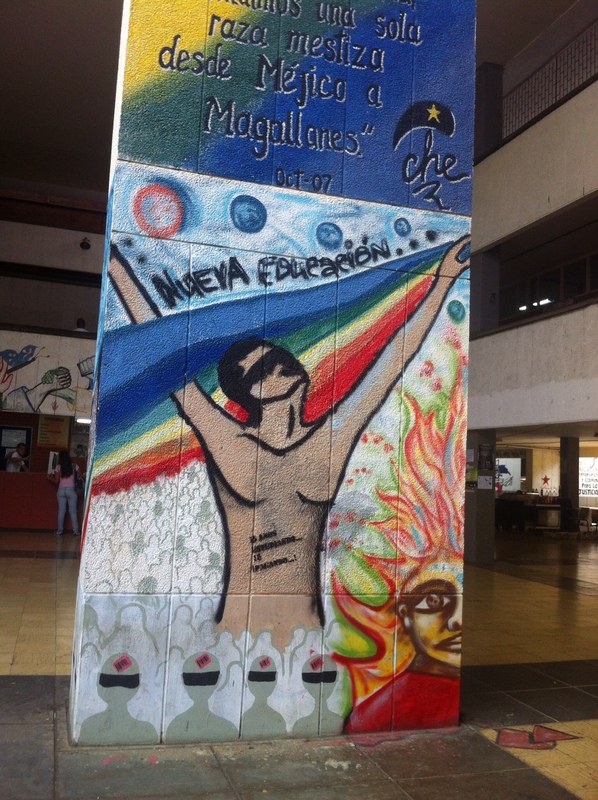 Murals inside Cali's Universidad del Valle. After forty-five minutes of walking, the buildings begin to grow thinner, longer and taller. The streets lose their flatness and wind upwards and around, but still crack with the effort of it. Palm trees mark roundabouts and huge metal gates wall in the houses of the Colombians who don't need to visit downtown. The bridge crosses the river and you're back in the thick of it, but this time it's not so abrasive; wider spaces are accommodated by metro stops, small parks and plazas, whitewashed banks and other grand edificios. This is Cali's central district. Cali is famous for two things: its women and its salsa. I was only interested in one of those things (and I can't dance, hence the catch 22). 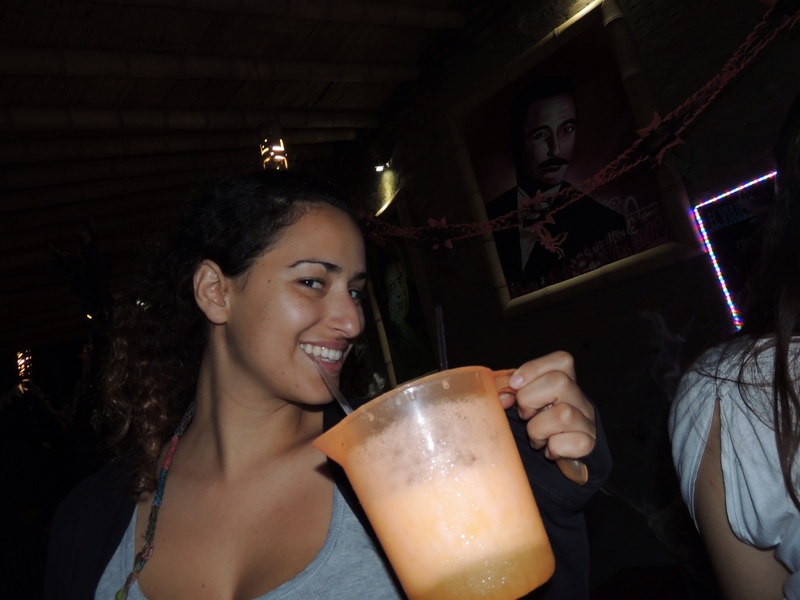 Each night a different bar plays host to the quick feet of the locals and the sloppy steps of the gringos. The (Colombian) men lead the charge, plucking girls from the middle of the dancefloor and parading their moves to the jealous onlookers, usually white-faced, while the gringas are treated to the nights of their lives. Maybe I'm being romantic, in fact, maybe I'm making it up, because my salsa is so non-existent I didn't even dare step foot in one of those places. Thankfully, I didn't need to because for me Cali would become all about the people I shared a few days with. Looks like I found the Isro-American again! On my very first evening in the city I wandered around the corner from my hostel in search of a panadería and some food. Success. Then I turned around, bun in hand, to spot a familiar mass of brown curls. This was the fourth time I had bumped into Alisa, and completely randomly might I add, in the last nine months. I could swear that my Facebook-hating, Isro-American friend is secretly following me, but she will never admit it. Thrilled nonetheless, I forced her to accompany me for the next couple of days as I wandered across town in search of the slow bikers, Nick and Kyle, who had somehow made it all the way from Otavalo up those Colombian hills and into town. To be quite honest, those couple of days were filled with eating and administration. Nick and Kyle were staying in the older, slightly upper-class, part of town, and Alisa and I took advantage of one particularly delicious Menú del Día while we waited for the boys to organise themselves. 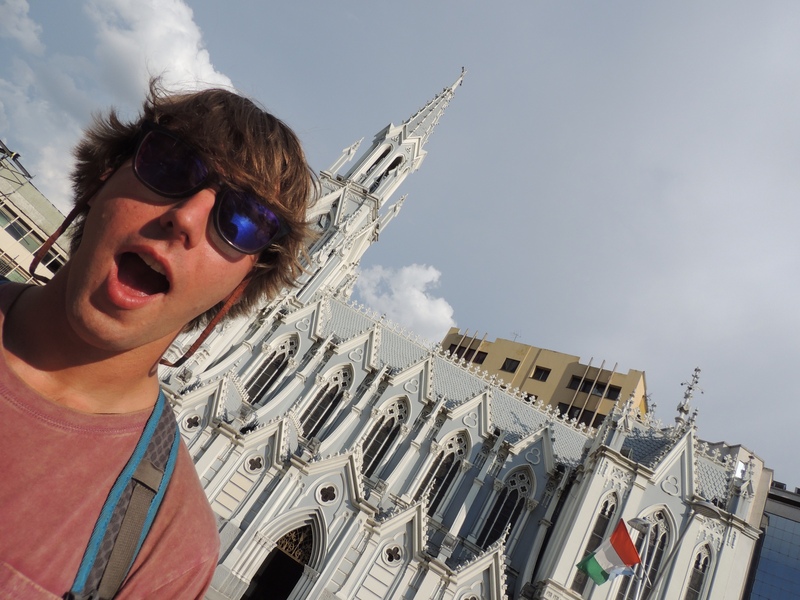 We took some walks through the city, but hey – just another South American city right? Colombia felt fresh and dangerous, more dangerous than anywhere we had been so far, so I spent a lot of time clutching my pockets, looking over my shoulder and not taking any photos. I spent a considerable chunk of one afternoon trying to buy a SIM card for my phone, to no avail. I cannot handle Gin Martinis. 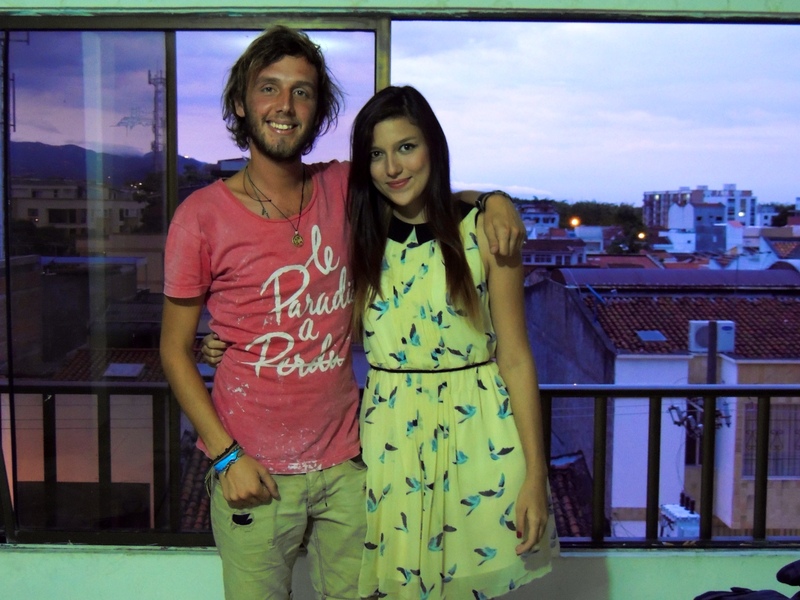 The great thing about Couchsurfing is that no matter what you're doing, you feel like you're accomplishing something. Even sitting around the apartment chatting to Andrea and her (awesome) housemates feels better than sitting around a hostel all day. Andrea and I at her apartment in Cali. However, we did manage to get out of the apartment eventually. We visited Andrea's university and I learned absolutely nothing about biology, but I think I made some bacteria. Spanish-speaking bacteria. Creepy cat park... Aw but they're so cute! Next stop was the mall, Unicentro, a glitzy, western paradise where you could swear for a moment you're back in Australia. 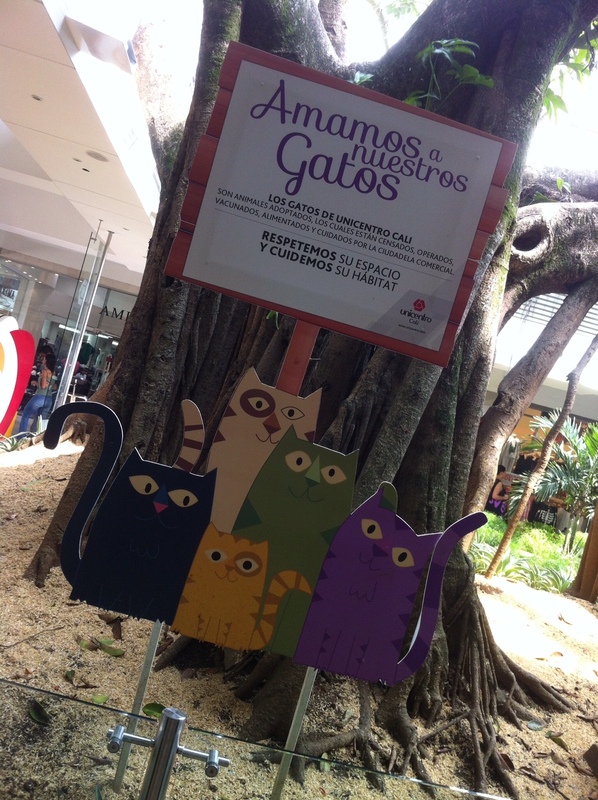 Except perhaps, for the bizarre 'Amamos a nuestros gatos', a special place in the mall where cats live and people can go and look at them. Andrea, with two spoiled cats of her own (Toto and Almendra) was basking in kitty heaven. There was no need for me to consume any more Martinis for the rest of my natural life, instead we were able to kick back and enjoy a movie in the comfort of a real home – something that is pretty special after a few months on the road. As with all my amazing Couchsurfing hosts, I'd like to use this space to thank Andrea and her housemates for the openness and kindness they showed while I stayed with them. Enjoy the remaining photos from Cali (below) and please feel free to use the comments section, I'd love to hear your feedback. Who said not having Facebook avoids embarrassing pictures appearing online? Just so you know- i’m not at all embarrassed, and I could say the same to you about stalking me! Hope you’re enjoying Venezuela, the only country in south America I’m not allowed in to! Would I ever stalk you? 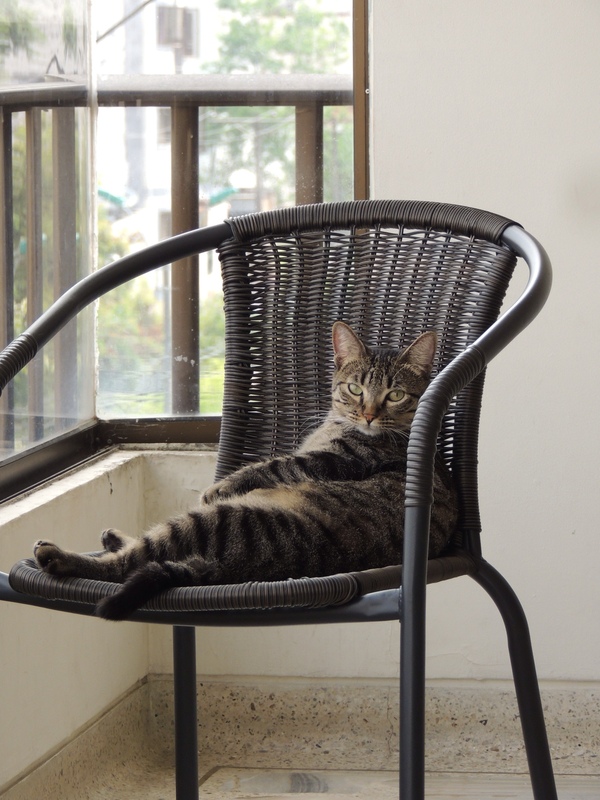 Of course you’re allowed in, you just have to use your Ameri… Uh, Israeli… Oh. You’re not. seriously enjoying reading your blog! 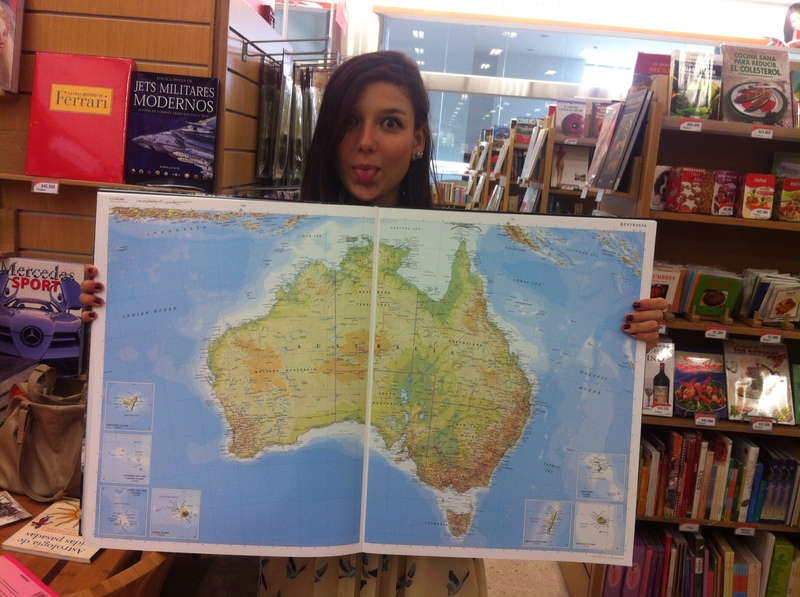 i got back home (israel) 3 months ago, and when ever im reading your blog i feel like im still traveling around SA. Thanks Annie! I’ll be sure to check out your page. 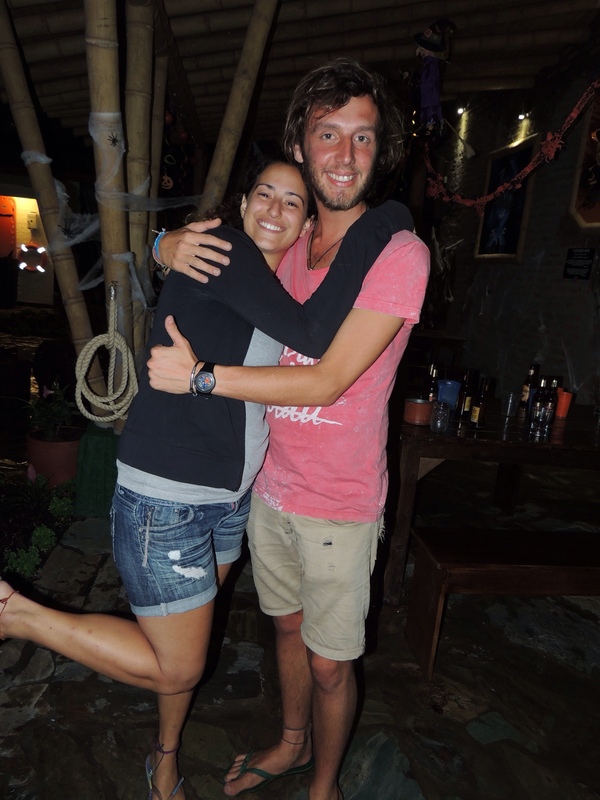 Keep commenting, it is really great to have feedback from other backpackers!